Can someone tell me how many Bulleid Coaches are operating on the MHR and Bluebell especially and awaiting overhaul to date? Elsewhere would be great too! 1481 - Requires overhaul after long period in traffic. SOBT (Semi Open Brake Third). 4227 - Unrestored semi coupe. 5768 - Under overhaul (owned by Bulleid Society). Details on coaches at MHR and Swanage to follow. In addition to the coaches already mentioned at the Bluebell they have previously broken up No's 4008, 4035 and 4036 retaining substantial quantities of parts / spares and the complete underframe from 4036. An interloper onto the Midland region can be found at The Vintage Carriage Trust (Ingrow) on The Keighley & Worth Valley Railway. Bulleid TO 1469 is coming to the end of a very extensive restoration. Lets hope that it is not too long before we can see it running behind City of Wells! 34092 is no where nr completion as I understand it?? She is more advanced than most people think but still a way off. The new tender tank is finnished complete with the high sided vallances and has been fitted on the frames, work progresses apace on the loco itself. I will see if I can find the pictures of the loco someone posted online a few weeks back when the front end was briefly towed out of the shed. Be great to see. Unfortunately the KWVR doesn't seem to give any news on the locos overhaul. But going back to Bulleid stock, how many do the KWVR own and where are other Bulleid stock around the country? 35005CP wrote: Be great to see. Unfortunately the KWVR doesn't seem to give any news on the locos overhaul. But going back to Bulleid stock, how many do the KWVR own and where are other Bulleid stock around the country? The VCT at the KWVR have only the one Bulleid Coach along with a Southern Railway "Matchboard" Corrridor Brake Third No 3554. Thanks for that - How about Bulleid stock around the rest of the Preserved lines? Also, I am going to move this thread to the Passenger and Freight section. 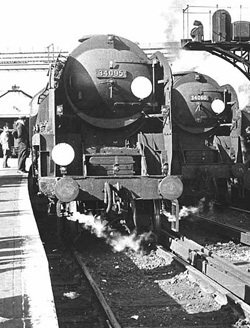 It was initially thought that the Bluebell had swapped another Bulleid SOBT for 4227 but in fact the vehicle concerned was a standard Full Brake (non Bulleid). TO - 1457 In very poor condition. SOBT - 4365 Under repair. SOBT - 4366 In very poor condition. 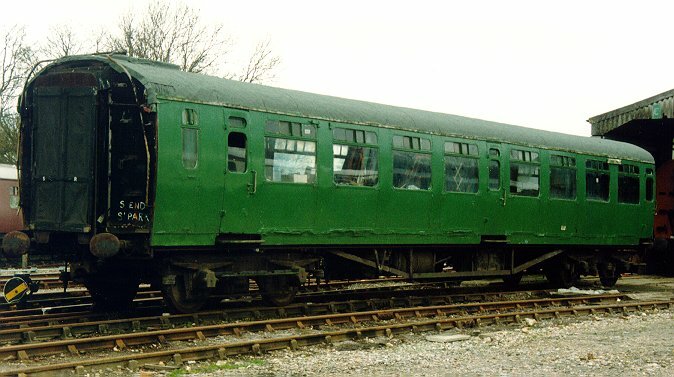 CK - 5761 (sold by MHR to Swanage). Awaiting overhaul. I am pretty sure the MHR have 4 or even 5 from memory - If you look down what they call the Headshunt at Alresford? 35005CP wrote: I am pretty sure the MHR have 4 or even 5 from memory - If you look down what they call the Headshunt at Alresford? Not anymore. They originally had 4 in the shape of 4211, 4367, 2850 and 5761. 2850 was scrapped with components going to Swanage. 5761 was sold to Swanage and currently awaits overhaul there at the moment. 1353 LSWR Ironclad Brake 3rd. 4151 (7851) SR Restaurant 3rd built to LSWR diagram. I've just checked and only 2 are showing - Up to 2/3 years back they had some others. It appears as though 4211 & 4367 still exist. 35005CP wrote: I've just checked and only 2 are showing - Up to 2/3 years back they had some others. It appears as though 4211 & 4367 still exist. 4211 has been restored with some modifications to allow wheelchair access. 4367 is undergoing a very long and extensive restoration including the replacement of one entire end. I remember both if not a couple of other Bulleid stock on workings that I have done as 3rd man when I started at the MHR?? Latest news is that the KWVR have recently rebuilt/overhauled a Bulleid Coach. This has not been painted into Southern green, but in Blood and Custard livery. This is ready to work with 34092 once overhauled. Incase no one has heard the latest news. Bulleid Coach Open Third no 1456 is leaving the Bluebell Railway to go to the MHR on a 25 year loan for restoration and Operation on the line! This is fantastic news for increasing the Bulleid fleet on the line! The problem I see is that the NRM transferred ownership of the coach to the Bluebell after a re-appraisal of their collection. But from what I can tell this was in order to get the coach in fully restored working order? The amount of work that is required is as follows. The major work that would have to be done is the replacement of all the external steel sheeting and window frames, and the building of the missing seating units. It is said the coach isn't in too bad condition and is subtantially complete? But I have to ask if this is after the update in 1980? A photo of the coach is shown below. If anyone else has a recent shot, I'd be pleased to see. Any news on the progress/Restoration?